The garden hose is a national treasure. I hope you’ll attend a Garden Hose Day celebration in your area. —Bob Logan, National Garden Hose Day Director. National Garden Hose Day celebrations around the country this year will include some new activities. Above is a Cleveland practice session for the new canine division of the Garden Hose Pull, the holiday’s most popular event. Dogs are enthusiastic contenders, but cats have shown no interest in the event. 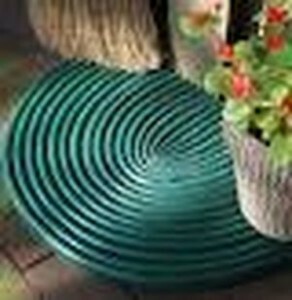 National Garden Hose Day officials have high hopes that the new date for National Garden Hose Day –moved from August 3 to June 21–will bring new energy to the celebration. Moving the event from summer’s “Dog Days” to its exhuberant beginning is expected to bring people out. Last year’s event was essentially a disappointment. Officials blamed a combination of drought conditions along with reluctance to support events that were seen as high water consumers for the downturn in attendance. Some of the popular events, like the traditional Hose Blast, received negative publicity because of high water consumption. The event has been discontinued. The Fire Hose Blast, although very popular, was phased out after 2013 and has now been officially cancelled because of complaints of high water consumption and injuries to contestants. The most popular of the new items according to pre-holiday reports is a garden hose recycling competition that has been underway for some weeks in several cities. This event offers prizes for innovative uses for old garden hoses. The purpose of the event is to find uses for garden hoses that at one time would have ended in landfills. 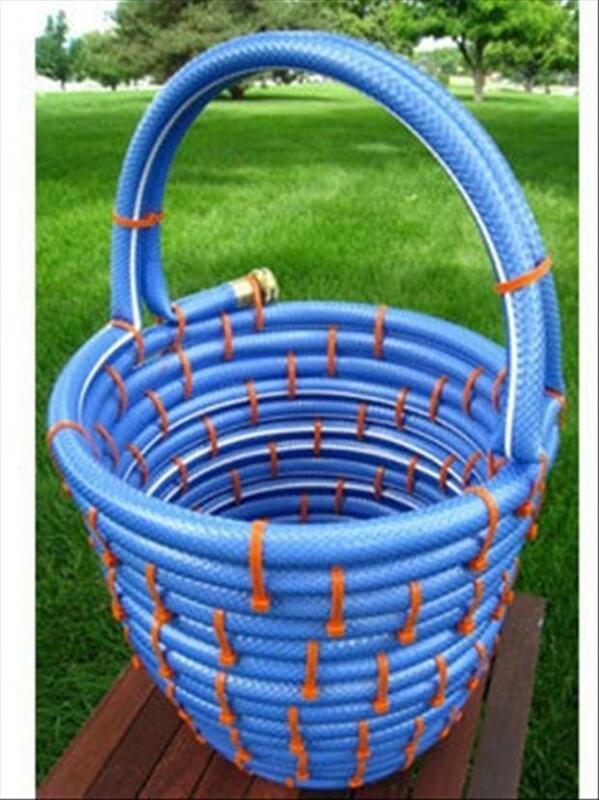 This colorful garden hose basket was made from a Baltimore family’s discarded hose. The hose was replaced because the color clashed with the trim on the patio. 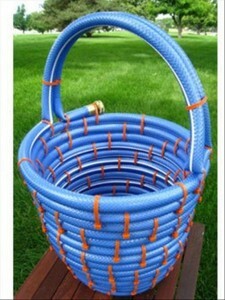 This garden hose basket could easily be worked into a self-watering planter. This attractive rug was created by a Phoenix family from a hose that had been in the family vegetable garden for almost a decade. Mr. Logan concluded: The garden hose is a national treasure, and Garden Hose Day is set aside to honor it. Look for events in your area.